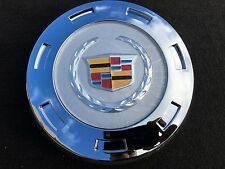 Cadillac DTS Wheel Center Cap Machined 17" Wheel 2007-2011. Cadillac DTS 2011 Base, L, Platinum 4.6L V8 - Gas. Cadillac DTS 2010 Base, L, Platinum 4.6L V8 - Gas. Cadillac DTS 2009 Base, L, Platinum 4.6L V8 - Gas. Part number 9596649. WITH COLORED CREST (LOGO). CADILLAC ESCALADE 2007-2013. COLOR CADILLAC LOGO. CENTER CAP WITH. Helpful Links. Everybody makes mistakes. But we won't argue with you. Factory original genuine hubcap. 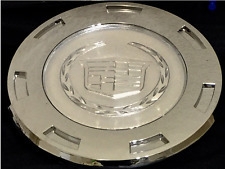 FIT FOR: CADILLAC ESCALADE 2007-2014 (ONLY FIT FOR 7SINGLE SPOKE 22” WHEEL). PART NUMBER 9596649. 2007-2013 CADILLAC ESCALADE COLOR CREST 22". LOOK AT PICTURES THAT IS THE ONE YOU WILL RECIEVE. Trending at $23.39eBay determines this price through a machine learned model of the product's sale prices within the last 90 days. PART NUMBER 9596649. 2007-2014 CADILLAC ESCALADE COLOR CREST 22". 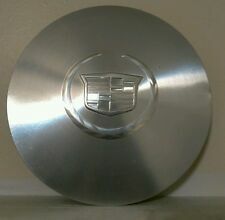 GM Cadillac OEM Factory wheel cover center cap. Has scratches & scuffs. ( I tried to show these in the photos. ). Always COMPARE the part number on this cap to the part number on the cap from your vehicle. Part numbers are stamped on the back of the hub cap or center cap. One of our photos in the ad shows the part number. 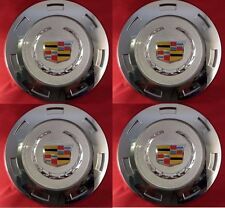 Genuine Cadillac Escalade 22'' Center Wheel Cap, Authentic GM Part. A used item that shows some wear. In overall good condition. Fits left side right side front and rear. OE Part Number: 23432315. FITS ONLY WHEEL SHOWN. Make/Model/Year: Cadillac Escalade 2015-2018. 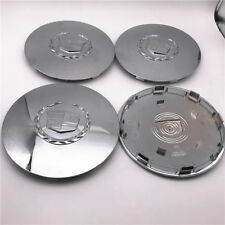 Product: Center Cap (Single). Part number 9596649. WITH SILVER CREST (LOGO). CADILLAC ESCALADE 2007-2013. CENTER CAP WITH. WHEEL - N – DEAL. They are found on limousines / funeral parlor hearse vehicles etc. They do not fit standard 5 lug wheels found on the standard Deville and DTS because they are much larger. The price quoted is per center cap. 2005-2014 Cadillac Escalade (18", 20", 22" Wheels). 2005-2014 Cadillac Escalade ESV (18", 20", 22" Wheels). Trending at $41.47eBay determines this price through a machine learned model of the product's sale prices within the last 90 days. CADILLAC XTS 2013-2015. 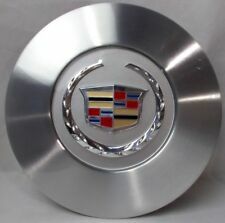 Single Silver Wheel Center Hub Cap For Cadillac CTS, ATS, XLR, SRX, STS, & DTS. CADILLAC ATS 2013-2015. CADILLAC SRX 2005-2015. CADILLAC DTS 2006-2011. CADILLAC STS 2005-2012. CADILLAC XLR 2005-2009. Part Number: 9596649. 2007-2014 CADILLAC ESCALADE (7-SPOKE 22” WHEELS ONLY). 2007-2014 CADILLAC ESCALADE ESV (7-SPOKE 22” WHEELS ONLY). 2007-2013 CADILLAC ESCALADE EXT (7-SPOKE 22” WHEELS ONLY). Will also fit many other Cadillac wheels require a 66 MM wheel cap or any of the part number Fits most Cadillac ATS, CTS, DTS, SRX, STS, XLR, XTS from 1994 - 2017. Quality: 4 pcs. We will do the best to solve the problem and satisfy the situation. Will fit the majority of rims that are 15". All legs will be good on the back. The price quoted is per center cap. The one shown is in comparable condition to the one you will get. IMPORTANT - This center cap DOES NOT fit 8 lug Limousine wheels! They are found on limousines / funeral parlor hearse vehicles etc. They do not fit standard 5 lug wheels found on the standard Deville because they are much larger. The price quoted is per center cap. 1996-2002 Cadillac. THERE WERE SEVERAL WHEEL OPTIONS FOR THE CARS LISTED BELOW.